It is unclear exactly where or when al-Khwārizmī was born. His name suggests he was born in Khwarizm, a place south of the Aral Sea in central Asia, in about 780. However, it was originally thought that the historian al-Tabari knew al-Khwārizmī had a second epithet “al-Qutrubbulli”, indicating he came from Qutrubbull near Baghdad in modern day Iraq. Another additional epithet added was “al-Majusi,” highlighting that al-Khwārizmī was likely born into the Zoroastrian religion, though he later came to identify himself as an Orthodox Muslim (Toomer, “Al-Khwārizmī, Abū Ja’far Muhammad Ibn Mūsā”). Adding to the ambiguity, it was later discovered that Al-Tabari’s original writings may have been copied incorrectly and a letter meaning “and” was omitted, which would have distinguished between two individuals, the first being al-Khwārizmī and the second, a man named al-Majusi al-Qutrubbulli. Thus, historical obfuscation of the two persists to this day. Not only are al-Khwārizmī’s origins unknown, but history cannot verify all of his accomplishments are truly his. The separation of these two individuals has never been confirmed and historians struggle to distinguish the achievements of al-Khwārizmī from the other. It is most commonly accepted, however, many scholarly treatises such as algebra, geography, Hindu numerals, and even the Jewish calendar can be accurately attributed to Al-Khwarizmi (O’Connor). Around the time al-Khwārizmī was born, Harun al-Rashid became the fifth Caliph, the chief Muslim civil and religious ruler regarded as a successor of Muhammad, and ruled from Baghdad. He proceeded to bring the study of intellectual disciplines to his court, which had been largely overlooked in the Arab world until this time. Harun had two sons, al-Amin, and the younger al-Mamun. After Harun died, an armed conflict between the brothers ensued. Al-Mamun won the conflict by slaying his elder brother in 813, taking the title of Caliph. He continued his father’s work and founded the House of Wisdom, an academy where philosophical and scientific Greek works were translated into Arabic. He also created a library of manuscripts, the first major library since Alexandria, Egypt. In addition, he set up observatories for Muslim astronomers to utilize in expanding their knowledge. Al-Khwārizmī worked with a group of scholars known as the Banu Musa, a group of brothers who were Islamic mathematicians (living ca. 800 – ca.860), at the “House of Wisdom.” Here, he worked for Caliph al-Ma’mun, translating Greek scientific manuscripts while studying and writing on algebra, geometry, and astronomy. His positions in the “House of Wisdom” and with the Caliph gave him support for his work. During this period, he produced his treatise on algebra titled al-Kitāb al-mukhtasar fī hisāb al-jabr wa’l-muqābala or The Compendious Book on Calculation by Completion and Balancing, and his treatise on astronomy, which is a further revision of the Zij al-sindhind. These treatises are not necessarily ground breaking material (in fact, there is debate over which sources al-Khwārizmī borrowed his knowledge from–Hindu or Greek), but are the first works of their types in Arabic. He corrected several mistakes the Greek and Hindu versions contained. He did not intend his works to be entirely new and described his work on algebra as: “what is easiest and most useful in arithmetic” (Toomer, “Al-Khwārizmī, Abū Ja’far Muhammad Ibn Mūsā”.) Both the Greek and Hindu branches of algebra were advanced beyond what al-Khwārizmī wrote, therefore, it’s likely he used previous works from both sources to create his own. Al-Khwārizmī also created tables of sine and tangents. He also did important work in astronomy. His book, Zij al-Sinhind, contained many important astronomical calculations including calendars and the true positions of the sun and planets. These astronomical works are based on Indian astronomers, yet influenced by Ptolemy’s work. He also wrote two works on the astrolabe’s use and creation, but neither survived. In addition to his two most famous treatises on algebra and astronomy, he wrote several other works on mathematics, which did not survive their original forms. Several Greek translations of these works remain, but it is impossible to tell how close the translations are to the originals. Al-Khwārizmī also wrote Kitab Surat-al-Ard, a major work on geography, where he improved Ptolemy’s work on the world map. He improved the map’s accuracy by adding longitudinal and latitudinal coordinates for many previously undescribed locations. He specifically improved maps of the Arabic regions, leaving Ptolemy’s charts of Europe untouched. Al-Khwārizmī’s works had uncommonly large success and influence given their rudimentary nature. He was influenced Hindu scholars between the 5th and 7th centuries on their methods, rules, models, parameter values, astronomical knowledge, and practices. 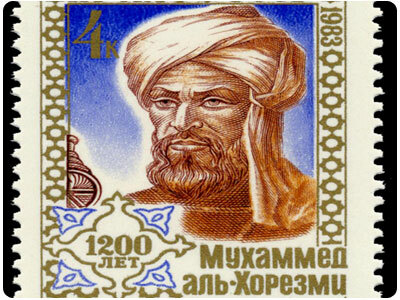 He died in 850 and is remembered as one of the most scientific minds of Islamic culture. Statue of Al-Khawarizmi in Uzbekistan. Photo by Michael Zaretski. Thomas Hockey et al. (eds.). The Biographical Encyclopedia of Astronomers, Springer Reference. New York: Springer, 2007, pp. 631-633. Tooner, G.J.,”Al-Khwārizmī, Abū Ja’far Muhammad Ibn Mūsā.” Complete Dictionary of Scientific Biography. Vol. 7. Detroit: Charles Scribner’s Sons, 2008. 358-365. Gale Virtual Reference Library. Web. 4 Sept. 2014.